~is a plan which places the most burden of costs on the poor, middle class, and the elderly. Paul Ryan and his colleagues were so cocky after their landslide victory election in 2010 that they really thought they could push forward an extreme plan like this with little resistence. They could finally achieve their dream of ending Medicare. Well, it backfired and may have become their biggest blunder going into the 2012 elections. The Ryan plan does maximum damage to Republicans because of its insistence on treating entitlement reform and tax reform as two tightly associated problems, rather than two separate issues to be handled at two separate times. Ryan’s plan cuts the top rate of personal and corporate income tax from 36% to 25% with promises of offsetting revenue raisers to be determined later. Because Ryan’s tax cuts were specific and his promises of revenue-raising reform ultra-vague, he had no defense to the attack that his tax reform involves massive downward redistribution of the tax burden. And after all, it’s hard to imagine what tax enhancements would counteract the distributional effect of a cut in the top rate of income tax from 36% to 25%. Ending the mortgage interest deduction for mortgages of between $417,000 and $1,000,000 (a good idea!) would not do it. Ending the deductibility of state and local taxes (another good idea) would not do it. A carbon tax (good idea again) for sure would not do it. Ditto a VAT. All of those measures would be good ways to raise additional revenues while leaving the current rates in place. But as offsets to a huge upper-income tax cut, they look like a shift of the tax burden from the upper class to the more affluent parts of the middle class at the same time as the rest of the Ryan budget removes Medicare coverage from the more affluent parts of the middle class – and leaves the remainder of Medicare very probably increasingly inadequate even for poorer Americans. The one thing that might have enhanced the attractiveness of the Ryan Medicare plan is some kind of assurance of adequacy of the future Medicare vouchers for Americans under age 55. Remember, under the Ryan plan, not only are Medicare vouchers means-tested, but they are also scheduled to grow in value at a deliberately slow pace. Today’s 40-somethings have good reason to fear that the vouchers will prove inadequate when it comes their time to retire. Those fears could be allayed to a certain degree if Republicans would support any of the various initiatives to weaken the pricing power of healthcare providers. Some of these initiatives are included in the Affordable Care Act, others are still kicking around the think tanks. But no. Republicans condemn almost all of them as just so many variations on the death panel theme. The result: CBO projects that by 2030 the Ryan vouchers would cover only about 30% of the cost of an insurance policy equivalent to Medicare as it now exists. I used to worry that Sarah Palin would be the Barry Goldwater of 2012. My bad. Paul Ryan is the Barry Goldwater of 2012. Democrat Kathy Hochul is running even with Barack Obama’s performance in the district in 2008 – the best Democratic showing in NY-26 in three decades. The Republicans suffered their worst losses in the least-educated portions of the District, where former GOP voters seem to have deserted the party for an independent candidate, Jack Davis. blue-collar voters react differently to issues than the GOP base does. They are more supportive of safety-net programs at the same time as they are strongly opposed to large government programs in general. These voters crave stability and are uncertain of their ability to compete in a globalized economy that values higher education more each year. They are also susceptible to the age-old Democratic argument that the secret Republican agenda is to eviscerate middle-class entitlements to fund tax cuts for the wealthy. The Ryan budget is uniquely vulnerable to that attack because it fuses very tough Medicare reforms with big tax cuts in the same document. In reality, Ryan is very unlikely to accept this draft. He declined the opportunity to run for US Senate in Wisconsin, likely because he sensed he could not win a state-wide election in which his budget would be the main issue. Now we’re likely headed to the worst of all possible worlds. The GOP will run on a platform crafted to be maximally obnoxious to downscale voters. Some may hope that Tim Pawlenty’s biography may cushion the pain. Perhaps that’s right, at least as compared to Mitt Romney, who in the 2008 primaries did worst among Republicans earning less than $100,000 a year. And yes, Pawlenty is keeping his distance from the Ryan plan. But biography only takes you so far. The big issues of 2012 will be jobs and incomes in a nation still unrecovered from the catastrophe of 2008-2009. What does the GOP have to say to hard-pressed voters? Thus far the answer is: we offer Medicare cuts, Medicaid cuts, and tighter money aimed at raising the external value of the dollar. No candidate, not even if he or she is born in a log cabin, would be able to sell that message to America’s working class. Submitted by Misty on Thu, 05/26/2011 - 3:07pm. Would seniors pay $6,359 more under the Republican proposal? The non-partisan Congressional Budget Office previously estimated that a typical 65-year-old's out-of-pocket health-care costs would rise to $12,513 from $6,154 -- tacking on an additional $6,359. But state-specific costs could boost that figure in some regions, the JEC report released Friday found. Health-care costs would rise the most in Florida, where a senior would typically face $7,383 in additional costs, according to the analysis. Seniors in Hawaii would see the smallest increase on a dollar basis, facing $4,209 in additional expenses under the Ryan proposal. At the end of last year, Medicare covered roughly 47.5 million people. Rasmussen Reports: By a near two-to-one margin ... don’t like Ryan's proposal. Submitted by John Martin on Thu, 05/26/2011 - 9:02pm. I'm still trying to wrap my head around Ryan's proposal. If you're trying to end Medicare and help the wealthy, why propose to do so in one full swoop? Now it'll be so much harder for them to achieve any of their goals. Submitted by Kelly Thomas on Fri, 05/27/2011 - 10:03am. Exactly, John. This was an inexcusable error of judgement because it spells out exactly who the Republicans will fight for and who they will leave behind in one single document. It also proves they really don't care about the deficit or decreasing spending as much as they care about their small government principles and tax cuts for the wealthy. They used to be so good at hiding their real agenda (which is why I stayed on board so long) but this exposes what they stand for in black and white. And it's a devastating blow to the GOP and impossible to defend. I am also starting to see why many Republicans still want to talk this up and voted for it. They truly believe in it and think this plan is a great idea. They think Americans will jump on the "kill Medicare train" once they sell the details better. They really do want to end Medicare as we know it in the name of "smaller government" and the "free market." The honesty in how they feel is appreciated but won't be rewarded at the voting booth. Submitted by Central TX Mom on Sat, 05/28/2011 - 11:44am. I'm STILL waiting for someone to explain to me exacty which health insurance companies are going to want to sell health insurance to 65, 70, 75, 80, or 85 year old people for reasonable prices. The bottom line of that story is that it is a losing proposition. The reality is that population costs a fortune in health care costs. Does someone really believe that insurance companies are going to do this? Fer realz? Submitted by Central TX Mom on Sat, 05/28/2011 - 11:49am. Oh, and I'm married to a 51 year old man, so we would get to be in the first wave of folks in the experiment. Not cool. Submitted by TomG NY on Sun, 05/29/2011 - 2:19pm. I am certainly willing to cop to Ryan's plan as a "major political vulnerability" for Republicans if Dems press the advantage effectively and don't get lazy and sloppy the way they did after health care reform passed in March 2010. I'm not ready to declare a suicide watch on the GOP just yet. High unemployment in key midwest toss up states and Jeb Bush on the ticket as 1 or 2 could make Ohio, Florida, and others iffy at best in 2012. But the news was super good this past week -- no doubt about it. Kathy Hochul in NY 26 (MY NEW CONGRESSIONAL REP!!!! YAYYY!) may ultimately have as much influence on putting taxes on the rich back in play as she did for adding momentum to a center-based pushback against right wing decimation of medicare. Note to Obama and WH communications staff: Hochul won by being as negative and direct in her attacks on the Ryan plan and its supporters as Republicans were against her. No gracious across the aisle softening of the tone, no talk of "silly season," no praise of her opponent as a loyal American, no pontifications about how the American people want Democrats and Republicans to work together, AND NO SITTING AROUND FOR WEEKS ABSORBING NEGATIVE ATTACKS WITHOUT COUNTER ATTACKS -- AND GOOD ONES. It was day-in and day-out, punch in the gut "Ryan/Corwin (R NY 26) will "end Medicare as we Know it." Sir, please lead this fight as if it were a fight or turn the reins over to Biden and go away. Submitted by Kelly Thomas on Mon, 05/30/2011 - 9:30am. Tom-I was thinking about you as I watched Kathy Hochul's campaign unfold and expand and I figured you must have been quite impressed. Finally, a Democrat unafraid to really go after a bad plan and-yes-to use the fear card as part of it (although in this case, seniors and everyone else did have reason to fear! It wasn't just a made-up trick like the GOP used against "Obamacare") If Democratic leaders were paying any attention and want to win back the House or at least come close, they should have been taking notes as they watched this young talent. Her campaign should be used as the golden standard. It appears many of them were quite impressed and it is refreshing to hear people like Wasserman-Shultz, Israel, Schumer, and Pelosi making a point of saying "we intend to repeat that strategy because it worked!" But it's a long time until election day so will they get distracted, lose focus, be afraid to go negative? Time will tell. I can't imagine them letting this opportunity go to waste. I see Ryan and the GOP trying to turn the tables as they play defense but their message seems pretty confusing to me and I don't think seniors will buy the "Democrats hit Medicare first" argument, especially when they realize under Ryan's plan seniors would pay an extra $6000 for Medicare minimally. Democrats need a simple message: "we will save Medicare by fixing the waste, fraud and abuse in Medicare, working on controlling costs, and looking at how to increase revenue to pay for this great program while Republicans end Medicare by cutting benefits and making the consumer pay more while costs soar." Feel free to chime in as we get closer to 2012, always good to hear your thoughts on whether Democrats are learning any lessons. If you answer in the affirmative, I will KNOW the Democrats are on the right track. I keep thinking that the debates of 2012 will seal the deal for Democrats and may finally expose the real agenda of current Republicans. How can any Republican admit they voted for or would have voted for the Ryan plan and try to justify that? And will they get any support from establishment Republicans if do not support the Ryan plan? How can they say they want to repeal Obamacare when it means not closing the donut hole for seniors, returning to discrimination based on pre-exisiting conditions, and kicking off all those 26 year olds now able to stay on their parent's insurance? It would not surprise me if Republicans try to reduce the number of debates so these issues don't get exposed. If it's Palin, she'll just decline all debates, blaming the lamestream media. The Democrats are not perfect but they have better ideas on all the major issues and I hope they can market that fact to their advantage. They have a great opportunity right now with the Medicare blunder of the GOP. Hope they don't hold back! Paul Ryan's Op-Ed vs. Steve Israel's Op-Ed. Weird thatRyan highlights cost of Medicare but doesn't mention that his plan does nothing to deal with cost other than to shift to the seniors. But obviously, they have decided to mislead the people in order to explain away a bad plan. Will it work this time? The failure of politicians in Washington to address the crisis in Medicare is putting the health security of Americans at risk. The U.S. House of Representatives recently passed a budget that advances a plan to save Medicare for today’s senior citizens and strengthen it for future generations. But instead of seeing an opportunity for bipartisan action, President Barack Obama and his party have seized it as a chance to play politics with the health of our nation. The Democrats’ dishonest characterization of this plan before the special Congressional election in New York State on May 24 was just the latest example. Here are the facts. Medicare is a critical program that helps people age 65 or older achieve health security. But it’s headed for a painful collapse. Independent experts and leaders in both parties agree that if we do nothing, Medicare will exhaust its trust fund in nine years, putting enormous pressure on the federal budget as health-care costs continue to rise. Unless we act, we’re moving toward a debt-fueled economic crisis, harsh cuts that affect today’s seniors and enormous tax increases that diminish the dreams of the next generation. We can save Medicare, but we have to reform it so that it delivers the high quality we expect, at a price we can afford. If we don’t get skyrocketing health-care costs under control, we have no hope of containing government spending and averting a debt crisis. Health spending per person increases by almost 9 percent every year. As a result, total expenditure for health care has gone from consuming 5 percent of our economy in 1960 to almost 20 percent today. Medicare is a top driver of these unsustainable costs. More than 75 percent of Medicare recipients -- that is, 35 million people -- receive what’s called the fee-for-service insurance plan. This means that Medicare reimburses doctors and hospitals for seniors’ health-care services. This system leads to higher costs and lower quality for two reasons: First, the patient is disconnected from the cost. Fifty years ago, Americans spent a lot less on health care than they do today, but the share they paid for directly was much larger. In 1960, patients paid for about half of their own health-care costs. Today, that share is down to just 12 percent, with the rest paid for indirectly, through third parties such as Medicare. We all pay for Medicare with our tax dollars, and Medicare patients also pay premiums, but someone else pays the actual bills -- and so the true cost of care is hidden. When we pay directly for something, and we know how much it costs, we have a strong incentive to demand the best value. In health care, we don’t. Is it any wonder that the costs keep rising? We take for granted that our parents and grandparents have access to health care. Before Medicare, seniors who could not afford it or seniors who were ill were unable to get health care and paid a terrible price: They had to choose between food and medicine. Medicare changed that. Tuesday night, in Upstate New York, a long-shot Democratic candidate won a deeply Republican seat after a vigorous debate on the Republican plan to end Medicare to pay for tax subsidies for Big Oil and tax breaks for millionaires. Rep.-elect Kathy Hochul made clear that seniors' dignity would not be sacrificed. And voters of all political parties sent a resounding and unmistakable message: Americans reject the Republican plan to end Medicare. Protecting and strengthening Medicare isn't about politics, and it isn't about electoral gains. It's about our seniors. It's about our priorities and values as a nation — about seniors' health, well-being and economic stability. It's about Democrats' belief that Medicare should not be abolished and transformed into a voucher system — it should be strengthened so it can continue to serve future generations. This is the message Kathy Hochul used to win in New York's 26th district; it's the same message we'll take to every district nationwide. Members of Congress have a choice: Keep our promise to seniors or cut the billions of dollars in taxpayer subsidies to Big Oil and tax breaks for multimillionaires and billionaires. Democrats choose seniors. Under the Republican budget, a millionaire gets a $100,000 tax break but a senior gets an additional $6,000 health care bill. Democrats will fight those wrong priorities. Democrats offered to engage with Republicans in a constructive and responsible negotiation to strengthen, improve and reform Medicare. But the Republican plan to end Medicare is non-negotiable. We can only hope Republicans are listening to Americans. We hope they will turn back their campaign to end Medicare and join Democrats on real solutions to strengthen Medicare, reduce the deficit, create jobs and grow our economy. Submitted by California-View on Wed, 06/01/2011 - 3:32pm. The thing about Medicare, similar to Social Security, is that no Corporation is able to gather huge profits from the entire exchange. Many corporations have become addicted to the government contracts and thus the underlying source of such funding Tax-Dollars. The only way to maintain a supply of tax-dollars for a corporation’s revenue stream is not through advertising, but government lobbying, election campaigns and perhaps a few corrupt activities. 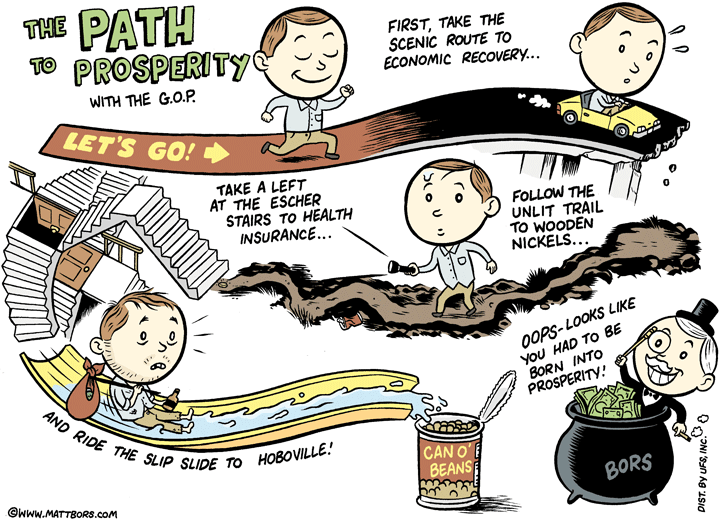 Tax-Dollar Dependent corporations, and worse entire industries with TDD are a continuous drain on the American economy. Like a leech sucking the blood from a soldier's leg in the field, constantly pulling precious resources for no other purpose than it's own survival. Americans will have to wake up and work hard to purge the many leeches sucking on the government teat. The businesses have become institutionalized and not seen for the uncompetitive parasites they are. It will take years for the US to End Crony Capitalism in favor of competition and efficiency.